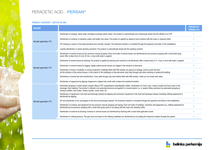 Peracetic acid - PERSAN® | BELINKA PERKEMIJA d.o.o. Peracetic acid is a strong oxidizing agent with excellent disinfectant and bleaching properties. Its action is based on synglet oxygen, that is released during chemical breakdown. Products of the breakdown are acetic acid, water, and oxygen. Peracetic acid is effective even at very low concentrations. It does not foam, it does not function selectively, and resistance in many cases are not observed. It can be mixed with water in all proportions and rinses free of residue. 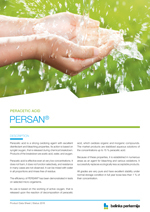 The efficiency of PERSAN® has been demonstrated in tests on selected micro-organisms. Its use is based on the working of active oxygen, that is released upon the reaction of decomposition of peraceticacid, which oxidizes organic and inorganic compounds. The market products are stabilized aqueous solutions of the concentrations up to 15 % peracetic acid.